, a late eminent and learned prelate, was born in August 1737, at Heversham in Westmoreland, five miles from Kendal, in which town his | father, a clergyman, was master of the free grammar-school, and took upon himself the whole care of his son’s early education. From this seminary he was sent, in November 1754, with a considerable stock of classical learning, a spirit of persevering industry, and an obstinate provincial accent, to Trinity college, Cambridge, where, from the time of his admission, he distinguished himself by close application to study, residing constantly, until made a scholar in May 1757. He became engaged with private pupils in November following, and took the degree of B. A. (with superior credit, being second Wrangler,) in January 1759. 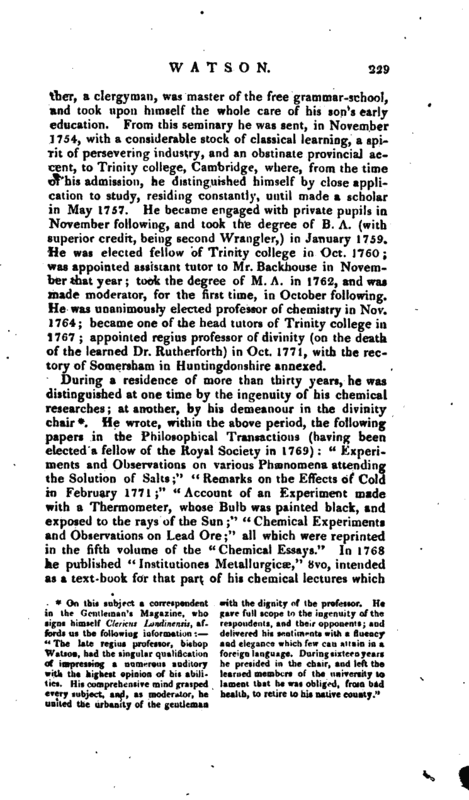 He was elected fellow of Trinity college in Oct. 1760; was appointed assistant tutor to Mr. Backhouse in November that year; took the degree of M. A. in 1762, and was made moderator, for the first time, in October following. He was unanimously elected professor of chemistry in Nov. 1764; became one of the head tutors of Trinity college in 1767; appointed regius professor of divinity (on the death of the learned Dr. Rutherforth) in Oct. 1771, with the rectory of Somersham in Huntingdonshire annexed. In 1774, he was presented to a prebend in the church of Ely; and in January 1780, succeeded Dr. Charles Plumptre in the archdeaconry of that diocese. 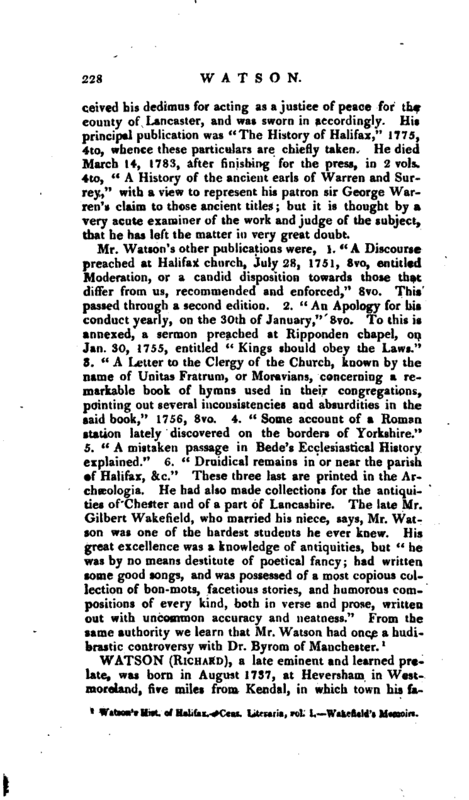 He published a sermon preached before the university at the general fast, Feb. 4, 1780; and a discourse delivered to the clergy of the archdeaconry of Ely. In August that year he was presented by bishop Keene to the rectory of Northwold, in Norfolk. These letters are short, and too curious to be omitted. Dr. Watson’s answer, it would appear, was not sent for above two years. "Sir, Cambridge, Jan. 14, 1779. 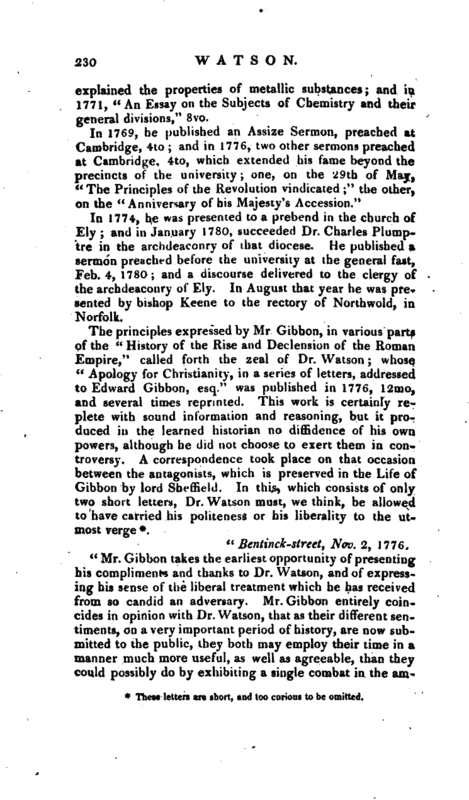 It will give me the greatest pleasure to ‘have an opportunity of becoming better acquainted with Mr. Gibbon. I beg he would accept my sincere thanks for the too favourable manner in which he has spoken of a performance, which derives its chief merit from the elegance and importance of the work it attempts to oppose.’ I have no hope of a future existence, except that which is grounded on the truth of Christianity. I wish not to be deprived of this hope; but I should be an apostate from the mild principle of the religion I profess, if I could be actuated with the least animosity against those who do not think with me upon this, of all others, the most important subject. I beg your pardon for this declaration of my belief; but my temper is naturally open, and it ought assuredly to be without disguise to a man whom I wish no longer to look upon as an antagonist, but as a friend. I have the honour to be, with every sentiment of respect, your obliged servant, V"
Having been tutor to the late duke of Rutland, when his grace resided at Cambridge, Dr. Watson was presented by him to the valuable rectory of Knaptoft, Leicestershire, in 1782; and in the same year, through the recommendation of the same noble patron, was advanced and consecrated to the | bishopric of Landaff. In consequence of the small ness of the revenues of the latter, Dr. Watson was allowed to hold with it the archdeaconry of Ely, his rectory in Leicestershire, the divinity professorship, and rectory of Somersham. 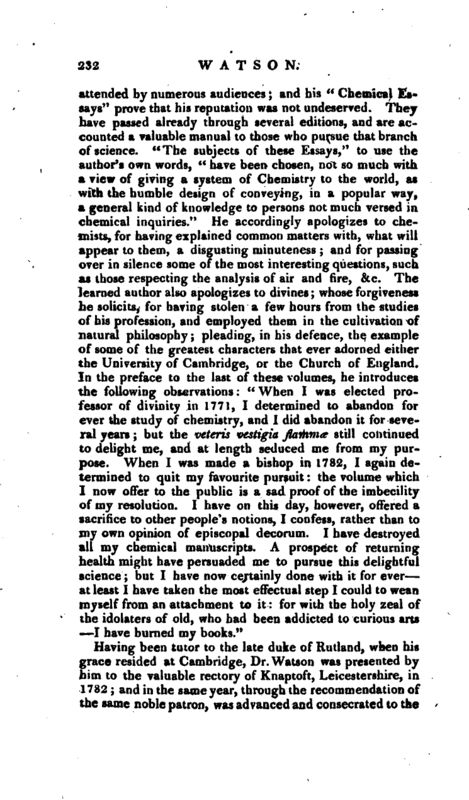 At that time his fame for talents and science stood very high; but his politics having taken an impression from the party which he had espoused, and which, though then admitted to power, had been in opposition, probably prevented his advancement to a more considerable eminence on the episcopal bench*. 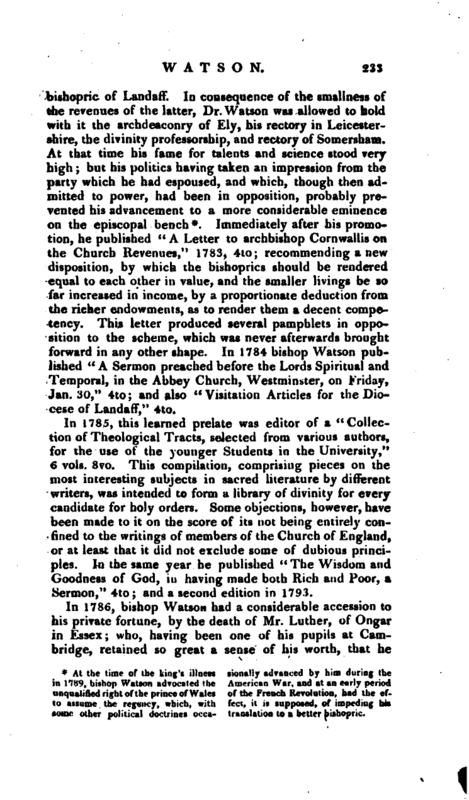 Immediately after his promotion, he published “A Letter to archbishop Cornwallis on the Church Revenues,” 1783, 4to; recommending a new disposition, by which the bishoprics should be rendered equal to each other in value, and the smaller livings be so far increased in income, by a proportionate deduction from the richer endowments, as to render them a decent competency. This letter produced several pamphlets in opposition to the scheme, which was never afterwards brought forward in any other shape. In 1784 bishop Watson published “A Sermon preached before the Lords Spiritual and Temporal, in the Abbey Church, Westminster, on Friday, Jan. 30,” 4to; and also “Visitation Articles for the Diocese of Landaff,” 4to. In 1785, this learned prelate was editor of a “Collection of Theological Tracts, selected from various authors, for the use of the younger Students in the University,” 6 vols. 8vo. This compilation, comprising pieces on the most interesting subjects in sacred literature by different writers, was intended to form a library of divinity for every candidate for holy orders. Some objections, however, have been made to it on the score of its not being entirely confined to the writings of members of the Church of England, or at least that it did not exclude some of dubious principles. In the same year he published “The Wisdom and Goodness of God, in having made both Rich and Poor, a Sermon,” 4to; and a second edition in 1793.
some other political doctrines occa- translation to a better bishopric. | bequeathed to him an estate, which was sold to the earl of Egremont for 24,000l. 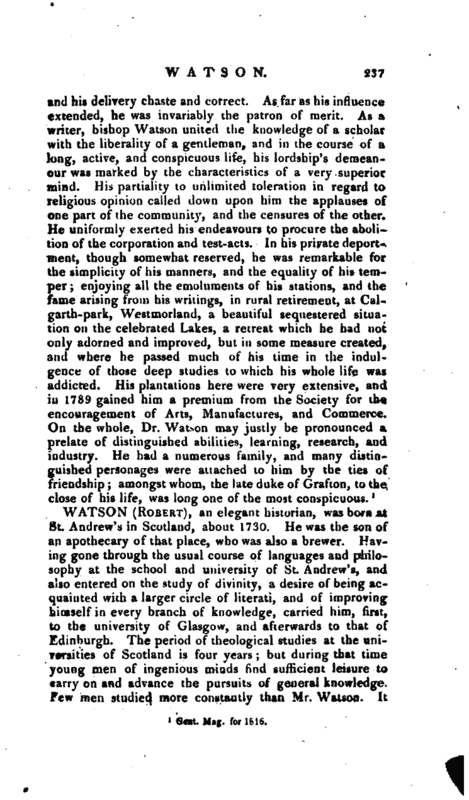 In 1788 he published “Sermons on Public Occasions, and Tracts on Religious Subjects,” 8vo, consisting. chiefly of smaller pieces which had before been printed separately. “An Address to young Persons after Confirmation, 1789,” 12mo, which had been annexed to the first of his charges; and (anonymous) “Considerations on the Expediency of revising the Liturgy and Articles of the Church of England,” 1790, 8vo. On the 27th of February, 1791, bishop Watson preached, to a crowded congregation, at the church of St. Martin-in-the-Fields, a sermon before the governors of the Royal Humane Society, and again pleaded for the same Society in 1797, in a sermon at St. Bride’s, Fleetstreet; but neither of these has been printed. 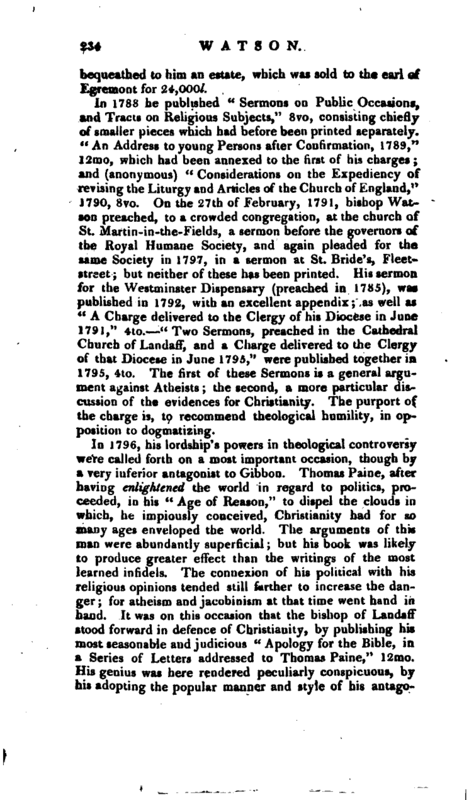 His sermon for the Westminster Dispensary (preached in 1785), was published in 1792, with an excellent appendix; as well as “A Charge delivered to the Ciergy of his Diocese in June 179J,” 4to. “Two Sermons, preached in the Cathedral Church of Landaff, and a Charge delivered to the Clergy of that Diocese in June 1795,” were published together in 1795, 4to. The first of these Sermons is a general argument against Atheists; the second, a more particular discussion of the evidences for Christianity. The purport of the charge is, to recommend theological humility, in opposition to dogmatizing. From the very i commencement of the discussions on the slave trade, his lordship always stood forward as a strenuous advocate “for its abolition; and though in the earlier years of the eventful contest with France which speedily succeeded, he in general recommended pacific measures, yet before its conclusion he became convinced of the necessity of prosecuting the war with vigour. His lordship’s” Address to the People of Great Britain,“1798, 8vo, is evidently the address of a man, who amidst all the differences in matters of less moment, feels honestly for his country in the hour of danger, and wishes to unite all hands and hearts in her defence. Such a tract from so distinguished a character was not likely to pass unnoticed: several replies appeared, among which the most intemperate was that of Gilbert Wakefield. 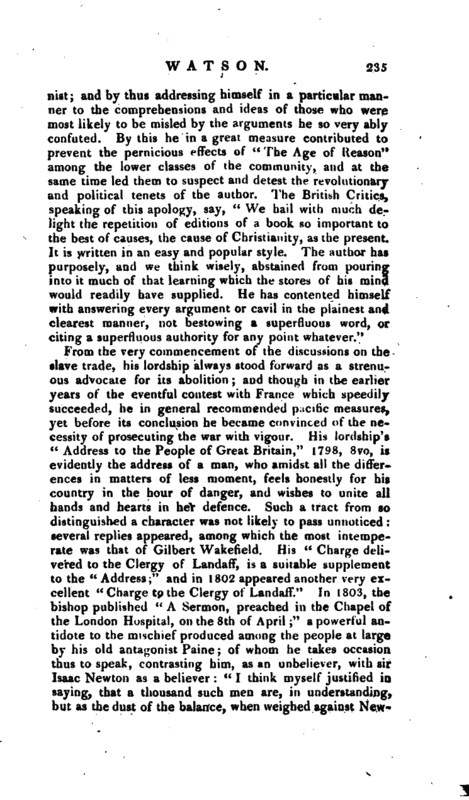 His” Charge delivered to the Clergy of Landaff, is a suitable supplement to the “Address;” and in 1802 appeared another very excellent “Cnarge to the Clergy of Landaff.” hi 1803, the bishop published “A Sermon, preached in the Chapel of the London Hospital, on the 8th of April;” a powerful antidote to the mischief produced among the people at large by his old antagonist Paine; of whom he takes occasion thus to speak, contrasting him, as an unbeliever, with sir Isaac Newton as a believer: “I think myseli justified in saying, that a thousand such men are, in understanding, but as the dust of the balance, when weighed against | Newton;” an indubitable truth, most usefully presented to the contemplation of the multitude. In the same year appeared his “Thoughts on the intended Invasion,” 8vo. 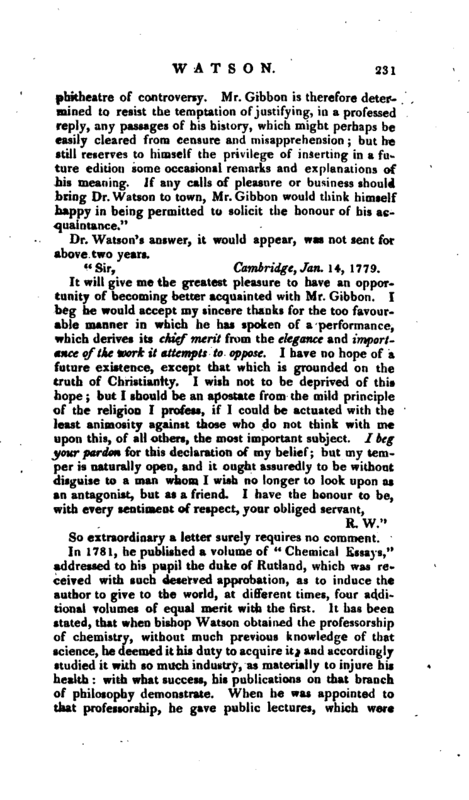 In “The Substance of a Speech intended to have been delivered in the House of Lords, Nov. 22, 1803,” which was printed in 1804, bishop Watson warmly entreats the nation, to coincide with the measures proposed for the emancipation of the catholics, and also states some proposals for freeing the nation of its public burthens by one patriotic effort. 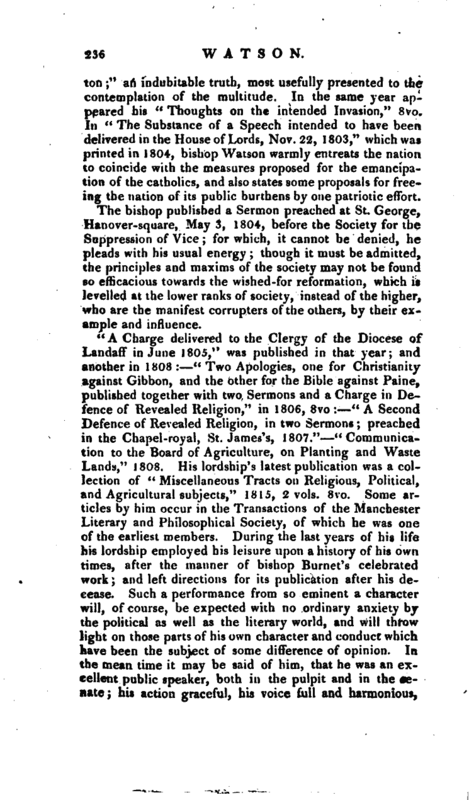 The bishop published a Sermon preached at St. George, Hanover-square, May 3, 1804, before the Society for the Suppression of Vice; for which, it cannot be denied, he pleads with his usual energy; though it must be admitted, the principles and maxims of the society may not be found so efficacious towards the wished-for reformation, which is levelled at the lower ranks of society, instead of the higher, who are the manifest corrupters of the others, by their example and influence. 1 Gent. Mag.’ for 1816.